Tenrikyo UK Centre is located to the North West from the London city centre and it takes about 30 minutes by London underground railway "tube". The UK Centre is just a 5 minutes walk from the Hendon Central underground station. The Hendon Central Underground station is on the Edgware branch of the Northern line. 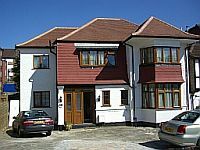 Heathrow Airport is located to the west from the London city centre and it takes about one hour from the airport to the London city centre by the Piccadilly Line of "tube". It roughly takes about 2 hours from the Heathrow Airport to the UK Centre.